The majestic coastal range serves as a backdrop to the unexpected explosions of green from the numerous islands that fill Howe Sound. The Lower Sunshine Coast is a changing blend of seascapes, mountains and forests and is steeped in the history of its first inhabitants, the Sechelt people. The Sunshine Coast boasts some of the best salmon fishing in British Columbia, spectacular scuba diving, great camping; a network of hiking and biking trails; a vibrant and active arts community and an atmosphere of friendliness. 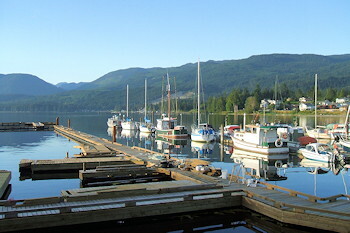 The Lower Sunshine Coast is composed of a number of small communities with such intriguing names as Gibsons, Sechelt, Halfmoon Bay, Pender Harbour and Earl's Cove. Each community has something special to offer the visitor; whether it be the Sechelt Nation's Museum in Sechelt, the Bird Sanctuary at Halfmoon Bay or Ruby Lake, the world's only fresh water lake where cutthroat salmon spawn. From spectacular BC Westcoast scenery to exciting outdoor recreation possibilities, the Sunshine Coast is a magnet for the outdoor enthusiast. 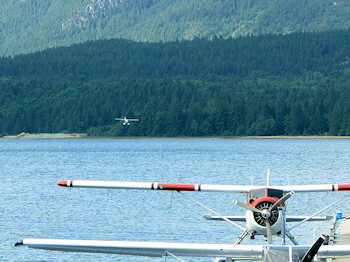 Float planes are a vital link to BC's coast. 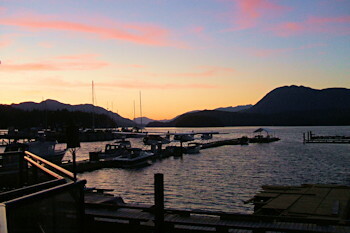 Access: BC Ferries takes you from Horseshoe Bay to Langdale where you can begin your adventures on the Sunshine Coast. There is also service by a local airlines and bus. Area - sightseeing, hiking, camping, swimming, charter boat trips, fishing, canoeing, kayaking, marinas. Accommodations: There are many motel/hotel accommodations in the area, plus lodges, resorts and private or provincial campsites.